Scene 1: Rescue the Villagers! Scene 2: The trail to the enemies' town. . . Scene 3: Sneak into the town. . . Scene 4: March forth to the Castle of Death-Adder. Scene 5: Defeat The Death-Adder! 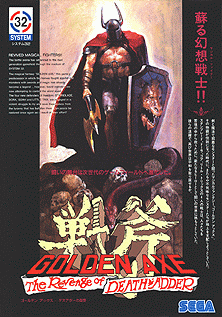 Golden Axe: The Revenge of Death Adder is an arcade beat 'em up released by Sega in 1992. There is no backstory given anywhere within the game or its documentation, but it seems that Death Adder didn't die for good in the original Golden Axe. He's regained the Golden Axe and is out to get his titular revenge. It introduces many new features to the Golden Axe series, most notably being that it adopts the advanced system of object interaction that has since been seen in Golden Axe III. With this new system magic pots and food are only picked up when you intend to by pressing attack when on top of them, rather than just stepping on them. There are also barrels, flags, statues, and other things you can destroy at will to get to goodies inside, or just for looks. While movement and interaction has become a little more involved the magic system has instead been simplified, each character now has only a single mind-blowingly amazing power to use. If you die with fewer pots than the minimum for you magic power you are given extra pots up to the minimum for your spell; for instance if you are playing as Goah and are down to 8 pots (not enough to cast) when you die, the game then gives you enough pots to make up the required 13. This page has been accessed 24,271 times.